I met Minnesota Twins starting pitcher, Kyle Gibson on December 20, 2016. After a stellar college career at Missouri, Kyle was chosen with the 22nd overall pick in the 2009 MLB draft. He looked to be on the fast track to the majors until he was sidelined by a UCL tear in 2011. He eventually made his major league debut on June 29th, 2013. By 2015, he had become a mainstay in the Twins rotation. On the surface, Kyle’s career seemed to be trending upward. However, underneath all the hope, promise, and potential, an secret was lurking. For two full seasons, Kyle had struggled with shoulder and low back pain. He had done all the traditional physical therapy available and, by his own report, he lived on anti-inflammatories. During the 2016 season, Kyle was alarmed and exasperated by a 7-week stint on the disabled list. Tired of the same old same old, and not willing to spend another disappointing season popping anti-inflammatories, he decided it was time to try something different. He reached out to his college pitching coach who referred him to The Florida Baseball Ranch®. Kyle scheduled a Precision Strike One-Day Evaluation and Training Session. We took him through 4 hours of intensive assessment. We started with a full medical history and a traditional orthopedic physical therapy evaluation. We then expanded the physical evaluation to include our more specific Baseball Ranch Assessment Tool. The Twins strength coach, Perry Castellano joined Kyle for the evaluation, so we were also able to get a detailed history of his strength and conditioning program. We took a look at his sleep, nutrition and hydration habits, discussed his pre-throwing warmups and his post-throwing recovery plans. Then we heated him up and shot a video of his pitching delivery. During the warmup and video, Kyle noted that he still felt a pinch in the front of his shoulder with every throw. He had no pain when he threw a 70z plyo ball into a Durathro® training sock. A systematic analysis of the video of his throwing pattern identified several inefficiencies the could all be combining to create the perfect environment for his pain. 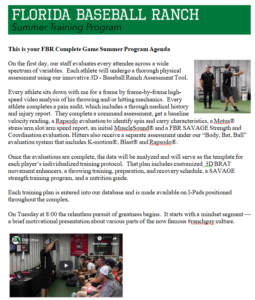 We took all that information and created a comprehensive training plan that specifically addressed all the possible contributors sub par performance and/or paint. Since he had no pain in the training sock, we decided to actuate a Level 2 self-organization throwing plan that included using the Durathro® Training Sock to perform multiple designed drills to activate his lower half, and a connection ball to improve his arm path. Kyle executed his plan well and by the time spring training rolled around, he was pain-free, well conditioned, and ready for action. Phil Miller of the Minnesota Star-Tribune interviewed Kyle during the first week of 2017 spring training. The Twins will be, too, if the nontraditional techniques produce more strikes, fewer runs, and healthier pitchers. Pitching coach Neil Allen observed Gibson’s methods over the weekend and was as excited about his pitchers’ passion as his workout. For Gibson, it’s more than a new way of thinking — it’s an entirely new way of delivering the baseball, about as fundamental a change as a pitcher can make. But the 29-year-old former first-rounder decided he had to do something drastic after muddling through a discouraging season that included a month and a half on the disabled list, only six quality starts out of 25, a 5.07 ERA, and discomfort in his back and shoulder that wouldn’t go away. He didn’t make a start all season without anti-inflammatory medication, Gibson said, and he was tired of the constant soreness. A former college pitching coach at Missouri directed Gibson to Randy Sullivan, who operates the Florida Baseball Ranch, a facility dedicated to keeping pitchers’ arms healthy. Sullivan, a licensed physical therapist, spent an afternoon explaining his techniques to Gibson and Castellano, and putting the pitcher through some demonstration exercises. The drills are meant to retrain Gibson and alter his throwing motion, so he holds the ball more upright, at an angle of less than 90 degrees, which enables him to reach his release point more directly. That, combined with a de-emphasis on extending his arm after releasing the ball, has dramatically reduced the amount of stress on his pitching shoulder. And so almost every morning before training camp workouts, Gibson goes through a series of unusual throwing exercises, using a balloon-sized rubber ball, an oversized glove that looks like a stocking cap covering his right hand, and a set of hardballs of varying weights. Keeping pressure on the large ball insures his arm doesn’t extend outward too far. The ball he releases into the giant glove acclimates his shoulder to a shorter post-release extension. Mike Berardino also wrote about it in the Pioneer Press. “Now 29 and set to earn $2.9 million after his first pass through arbitration, Gibson was annoyed and somewhat alarmed by a seven-week stint on the disabled list early last season. Sidelined by a shoulder strain after battling lower-back issues the prior two years, Gibson still felt “some discomfort” when he started his offseason throwing program, so he reached out to one of his former coaches at the University of Missouri for ideas. His old coach referred him to Randy Sullivan’s Florida Baseball Ranch, a two-hour drive up the road in Plant City. Gibson spent 4 1/2 hours at the facility on Dec. 22, undergoing baseline testing and giving Sullivan a chance to map out a three-week program. A licensed physical therapist who bills himself as “The Arm Pain Assassin,” Sullivan is affiliated with Ron Wolforth’s Texas Baseball Ranch, which new Twins chief baseball officer Derek Falvey visited multiple times during his days in the Cleveland Indians front office. According to Wolforth, the program has helped nearly 270 pitchers push their peak velocities to 90 mph for the first time. Increased velocity wasn’t Gibson’s aim, even though the pitcher now carries training balls weighing up to 32 ounces with him each day. Instead, the goal is to teach Gibson’s arm to pronate properly at the end of his delivery. That, in turn, should keep the humerus from rubbing on the shoulder’s connective tissues. Over the course of their initial consultation, Sullivan convinced Gibson that too much extension after the ball has been released “is only putting your shoulder at more risk.” They immediately began working to retool Gibson’s delivery. Now two months into Sullivan’s program, Gibson, who returned to Plant City last month for additional high-speed video analysis, has been encouraged by how his shoulder and back feel, and how his vaunted sinker is behaving. Watching a recent bullpen session, the pitcher’s father made an interesting observation. “Your arm just looks fast, like it was in college,” Harold Gibson told his son. Gibson theorizes he may have lost arm speed over time as he made adjustments to his delivery. A quicker arm can only add to the deception and effectiveness of his other pitches, most notably the changeup. In 2017, Kyle turned in the best Spring Training of his career. As the team headed North he and the Twins were excited about his performance and were expecting a break out season. Unfortunately, things didn’t work out as planned. For reasons still unexplained, Kyle’s command, which had been nearly flawless in spring training, went awry. After struggling to throw strikesKyle found himself back in AAA,.” He called me as soon as he got to Rochester. “Got any ideas?”, he asked. After discussing a few possibilities, we settled on what we call a 6-4-5 approach. In our 6-4-5 bullpen training, we ask the athlete to use a 6 oz weighted ball, a 4 oz underload ball and a 5-ounce baseball. He throws one pitch with each ball in the order of 6 oz, 4 oz, then 5 oz. from 20 ft away from a TAP Command Trainer target, then he repeats it at 40 ft, then 60’ and 80’ (if there is room behind the bullpen mound). After each throw, he annotates a command trainer chart, noting the exact location of the hits, and proximity to the target of the misses. One cycle gives him 9-12 throws. The number of cycles is up to the athlete. Kyle executed his 6-4-5 training, and after 11 days he was back in the big leagues. Over his final eight starts for the Twins in 2017, he went 6-0 with a 2.92 ERA. He carried that momentum into the 2018 season and put together his best season. Among his 29 MLB starts in 2017, he had 12 games in which he pitched at least six innings. Seven of them came over his final eight starts. Kyle continued his work over the winter of 2017 and his improvement continued. In 2018, he made 32 starts , lasting longer than six innings 20 times. His average fastball velocity jumped from 92.0 mph to 93 mph, and he showed workhorse durability, logging over 196 innings. The consummate pro, and a genuinely good guy, Kyle reached out on Twitter with a message for the FBR staff. It has been nothing short of an honor and a privilege to work with Kyle over the past couple of years. He’ll be hard at work this fall and winter, and if I know Kyle, the Twins can count on him coming back even better than ever. His willingness to take the extraordinary step of rejecting the status quo and seeking solutions outside of mainstream baseball is a testament to his commitment to the relentless pursuit of excellence. We are proud to call Kyle Gibson a #ranchguy! P.S. Still have a few openings in our last Elite Performance Boot Camp November 10/11. CLICK HERE and get here! !